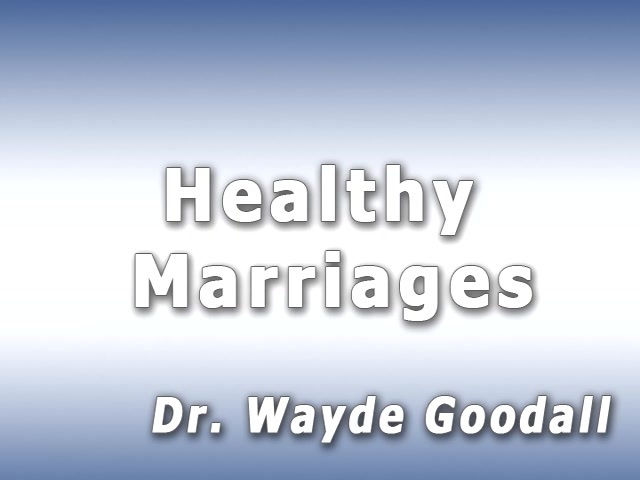 Hello, my name is Dr. Wayde Goodall and I want to thank you for listening to me as I talk to you about "Healthy Marriages Today." Around the world there's a lot of confusion about what is a marriage, what is a healthy marriage? But I believe that every human being is created to have a desire to be married and some have a desire to be single. But most of you want to be married. So what does a healthy marriage look like, and why is there so much confusion about this topic of marriage and family? Well there are three things that you need to understand when you get married. One, is the whole idea of commitment. Commitment for the rest of your life to this one person. Now it's an investment of your life into them but it's an investment of their life into your life. And so you make each other lives even better. I often tell people that when they get married and they know the Lord as their God than they have a triune relationship. They have the husband and they have the wife and they have God involved. And so this relationship really works because of that overall relationship. Three things you need to understand to have a healthy marriage. One, commitment. We're committed to each other for the rest of our life. And we're going to be committed even when things aren't working out well. We believe in that person. We're investing in them. And so when you become married it isn't something you choose to do because you feel good about it. Because true love in marriage is not based just on emotional feelings. Emotional feelings come and they go. A lot of times your emotional feelings have to do with the nights' sleep you had before today or the food you ate. Your emotions can be thrown off very easily. But in marriage you believe that love is commitment, love is a decision. You decide to do the loving thing for the person you're married to because you're committed. And commitment isn't something that's two weeks or two months or two years. Commitment is something where you become married and your committed to this person for the rest of your life. And so you have to understand that when you make this important decision to get married, or if you are married and you're not feeling really good about your spouse, understand that you can be committed. So understand in healthy marriage we have to have commitment. Number two we need to understand how to communicate. This is the number one complaint from ladies around the world. How do I help my husband communicate? Well men are not natural communicators. Ladies are natural communicators. And so men have to learn how to communicate in effective ways and understand the needs of their wife like the Bible tells us to. While women they speak on the average of three times more words than the average man. Men are doers, women are natural communicators. Communication is something that's verbal; it's non verbal. We communicate a message to another person, in this case our spouse, and they communicate back to us and we say words that they understand. Communication takes patience and there are ways that we communicate effectively. There are ineffective ways. Let me tell you a poor communication style that I promise you will end a marriage. One, when we communicate and every time we talk we begin harshly; in a rude form; in a mean way, that's not a way to start. And couples that begin communication we might as well stop it right then. And then the communication goes from harshness and it just executes even bigger and we start feeling negative about the other person. We start accusing them of things. And then we go into bad opinions about them, this is in communication, and then we can't fix the discussion or the problem we're dealing with because we feel bad about the person because the communication began in the wrong way. And then we start having bad memories about this person that we're married to the rest of our life. You know you can begin communication in a good way. You can start by complimenting the person or saying I want to discuss this. I want to have good communication between us. Well, this is just a brief discussion on the whole thought of communication and commitment, but understand this, in every relationship we need to know how to communicate effectively. Men with their wife, wife with their husband. Even with our children. And we need to understand that this is critical for a healthy marriage. But number three see that we need to understand is the whole idea of conflict management. Marriage is comprised of a commitment to another person. You want to stay married to them for the rest of your life, but you know you need to communicate. But in communication and in family there is always conflict issues. Conflict issues have been here since the beginning of time. And you know what, we can learn how to have conflict in our home, even in our family when there are children, and we can come to the right conclusions. And if you don't know how to be involved in appropriate conflict management, meaning we don't yell at each other, we don't call each other names, we never hit each other. These are abusive kinds of behaviors. And we can stop doing it. You might say well that happens in my home. Well let me tell you something about that. It's learned behavior. Everything that you have learned to do you can unlearn. You can change and become better at how to have conflict or communication skills in your life. And so know this; when in conflict there's escalating conflicts and anger, that's a danger sign and you need to be careful and kind of slow it down. Give it some time. And then you start avoiding each other because you can't talk or you can't be around each other. God doesn't want that to happen to you. God wants you to want to be with each other. We can take little breaks from each other because every relationship is a challenge, but when we're avoiding each other, hiding from each other because we're afraid of conflict, that's not the answer. Or we start dishonoring the other person. Putting them down, not respecting them, belittling them. We need to honor the person we're married to. Respect them for who they are, for who God created them to be. And then what can happen in conflict if we're not careful we can develop negative habits where we are continuing as I've mentioned to use words that are inappropriate or yell or even become physically abusive. These aren't ways that we treat people. We have a good God that created us to love people, especially love the person you're married to. Your children, we have each other and we're all important to each other. For the rest of your life you can know how to manage conflict. You can know how to communicate in appropriate ways. These are learned behaviors. You'll get better at it if you trust God and let him help you. And if you read the Bible and understand there are good ways to treat people, the people that you love and you're committed to. Let me tell you this. God will help you learn how to communicate better. God will help you be committed to another person. That he has created a very special person you can learn how to communicate and you can be committed to them for all of your life. And God will help you with conflict issues. I want you to know that God's on your side because God created marriage. He created marriage as a gift for you. And I hope that you trust him as you decide to be married for the rest of your life. I want to thank you for listening to me as I've talked to you about your family. And I also want to remind you that God created your family and God created you. The best way to make your life work is to be connected to your creator. The scripture tells us that if you confess with your mouth that Jesus is Lord and believe in your heart that God raised him from the dead you will be saved. When you do this you'll get connected to the creator. I want to pray with you right now to be connected to the one that created you and your family. Would you pray with me? Now if you've prayed that prayer with me and you want to pray even more with another person, hit "yes" on your computer screen and you'll be able to pray with another person. If you have more questions, and all of us have questions, God's good with your questions, I want you to hit another button, "I still have more questions." We would be thrilled to answer you. Thank you for praying with me today. God bless you. I'm Dr. Wayde Goodall.